I kept hoping for something special to headline the latest news article but in the end it's mostly updates about things we already knew. The official Sengoku Basara 4 Sumeragi website has been very quiet aside from a couple of comical teaser images which were posted for a short period - at the moment it's a shot of Sen No Rikyuu treating Masamune and Yukimura to a 'tea party' of sorts. I guess that's the price of having such an early announcement for the game. 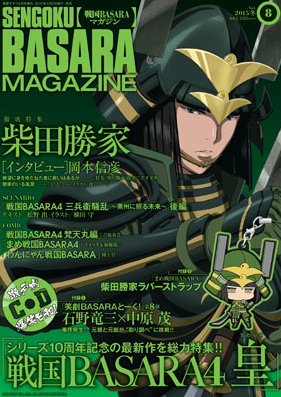 The e-Capcom website recently updated and added the prerelease details for March's issue of Sengoku Basara Magazine. Most notably, a small preview of the brand new cover illustration by Ookubo Tooru was included. 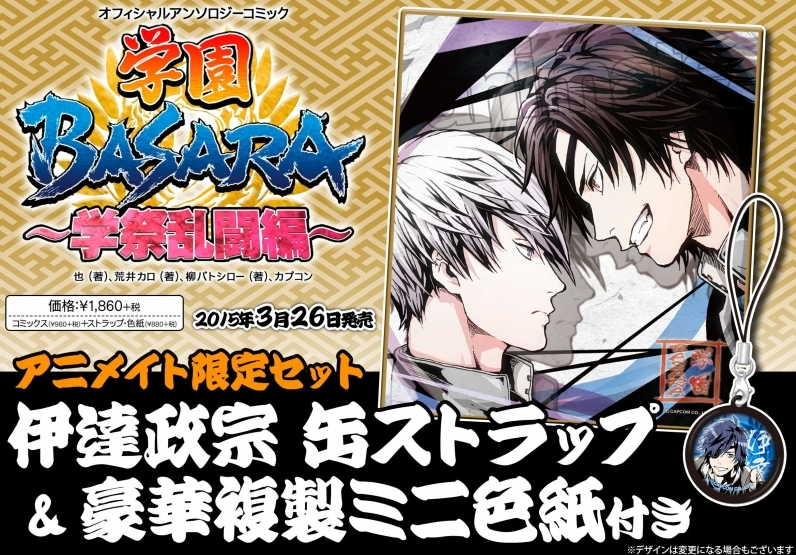 The description promises a recap of all of the Sengoku Basara 4 Sumeragi news in the lead article, as well as a 25-page feature about Katsuie with a piece of artwork by Karegishi Roji and an 'Oda Forces Chronicle'. Another new column will celebrate the series' tenth anniversary by going back into the production archives to dig out exclusive content from the time they were first working on Date Masamune's design. Its sounds as though there could be plenty of interesting material for long term fans. The official online e-Capcom store is running a Sengoku Basara Fair from 19th February until 5th March 2015, and leftover items from Basara Matsuri will start shipping out at the end of March - including the coveted bath set and opera glasses. The Basara Matsuri goods are strictly limited in quantity so if there's anything you wanted, I recommend visiting a proxy shopping site without delay! There are also a number of new fukubukuro 'lucky dip' bags themed around various characters and types of merchandise (badges, clear files, phone stickers). Many of these have already sold out. 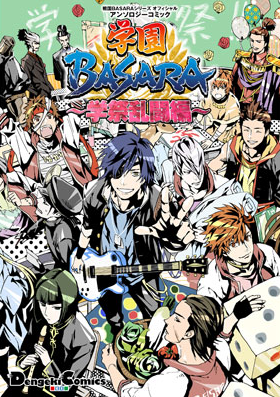 A preorder listing on the Manga Oh website reveals that Mame Sengoku Basara 4 volume 2 is scheduled for 27th April 2015. No further details have yet been announced, but we should hear more very soon. After the preorder listings were removed the future of this book seemed uncertain, but Amazon finally relisted it this week with the 15th April 2015 release date and a price of ¥2,138. There's no more news yet about what the book will contain aside from the vague comments included with the original solicitation. The eighth book in the Gakuen Basara series is due for release on 26th March 2015 and Animate have now unveiled a special limited edition bundle exclusive to their store. They don't ship internationally, but it's possible to order from them using a proxy service. Fans who don't mind paying ¥1,860 before tax (the book is normally priced at ¥980) will receive a Date Masamune strap and replica mini shikishi illustration along with their copy of Sengoku Basara Series Official Anthology Comic: Gakuen Basara: Gakusai Rantou-hen ('School Festival Brawl'). ...as well as a list of contributors: Nari, Kyuugou, Waganeya Takumi, PECO, Koutake Hiroyoshi, Mikami, Konko Yukime, Sanjou Kiiro, Arareya Kon, Rokuji, Sanorin, Yanagi Batoshirou and Arai Karo. Most of the artists are regulars but there are a few newcomers in there who may be familiar to doujinshi collectors. 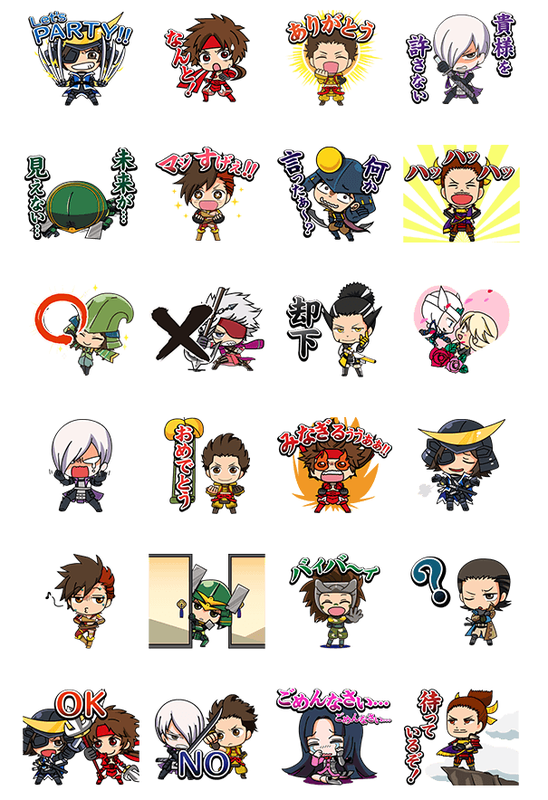 It's been a long time coming but the Sengoku Basara series has finally reached LINE in the form of a set of animated virtual stickers. The stamps are available now in the Japanese LINE store where they cost ¥200 - however, those of us outside the region may have to seek help from a friend or proxy buying service in order to make the purchase. Also, the 1st trailer of Sumeragi finally showed up on PSN when it updated at the beginning of the week.